In the early 1900’s, thousands of Albanians emigrated from their homeland to the United States. As a result St. John Chrysostom Albanian Orthodox Church was established in its present building in 1931 through the efforts of Fr. Mark Kondili. Prior to that the faithful had worshipped in a Serbian Orthodox Church and even a saloon. The present structure, built in 1848 was designed by noted architect, Napolean LeBrun who also had designed St. Peter and Paul’s Cathedral across the street. 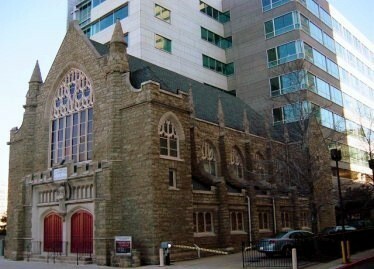 Originally St. John’s was the “Episcopal Church of the Epiphany”. In 1947, after incorporation, the Orthodox Community bought the building for $25,000. In the early 50’s the annual budget was around $2000. In 1957 English was used once a month. During the 60’s continued growth and activity—the Sunday School had 100 students—marked St. John’s as a “community” Church. In the 70’s the “Franklin Town” neighborhood restructuring stripped away the private homes forcing the parish to face new challenges. In 1990, after years of Communism and the brutal suppression of the Orthodox Faith, Albanian emigration to the United States and the Philadelphia area presented St. John’s with new families. Seemingly overnight, the aging congregation doubled with young Albanian families. The mission thrust exists on three fronts: the present families, the immediate neighborhood and the “New American-Albanian families.” Although its families live throughout the Greater Philadelphia area, St. John Chrysostom Albanian Orthodox Church is a community committed to the witness of God: Father, Son and Holy Spirit and the fullness of the Orthodox Faith in the City of Philadelphia.